The contoured shape of this ceramic mug makes it a truly unique gift. 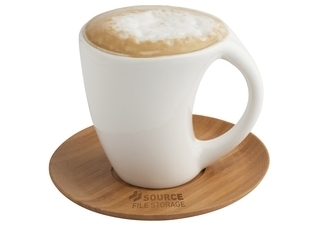 The saucer, featuring your engraved logo, is crafted from environmentally friendly bamboo and adds to the overall look and feel of this product. Because of the unique nature of bamboo, the product and engraving colour may vary from item to item.